Dark & Medium Brown Mixed Dreads Falls, 20 inches Long. Dark & medium brown mixed synthetic dread falls. The dreads are attached to a elastic band and you can wear them to ponytail, very easy to install and style in many different way. The model on the pictures wears 1 dread falls and you can achieve this looks with 1 but if you would like to achieve the full head looks you will need 2. Around 50 dreads in the each falls. We can email some instructions if need. > Please read our shop policies before purchasing the items. 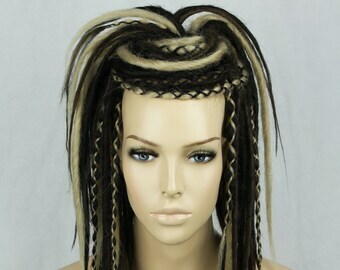 >>Also available Dread Falls, Wigs, Hair Pieces, Hair Extensions on our store. Blonde & Dark Brown Dreads Falls, 20 inches long. 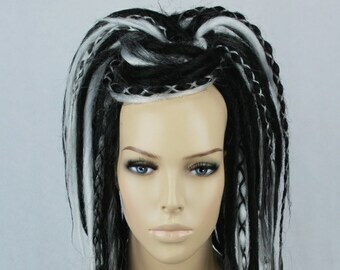 Auburn Mixed Synthetic Dreads Falls, 20 inches Long. 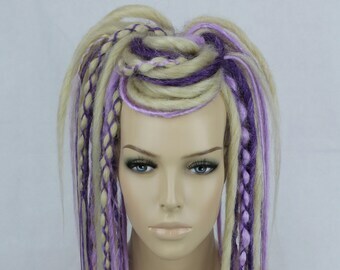 Mix Blonde Synthetic Dread Falls With Criss-Crossed, 20 Inches. Brown & Blonde Dreads Falls. 20 Inches. Ginger & Pink Synthetic Dreads Falls, 20 inches Long. Dark & Medium Brown Ombre Dreads Falls. Crocheted and Natural, 20 Inches. Blonde, Lavender & Purple Dread Falls. 20 Inches Long. Very realistic and even matches my own hair color. I still need to work on styling correctly but pretty happy so far! Also, seller was quick to respond to my question. I would recommend this shop. • Order must be in a original condition (un-used) & original packing to return. • Please contact us within 14days of delivery if you want to return the order. • After we get contact from the customer & agree to return the order, we request to ship within 30 days of delivery. • We don't cover the returning shipping cost unless we agree that the item was not described. • We don't accept returning for sales items & custom order. • If you request for the refund, we issue the refund once we receive the items and confirm it's in original condition. • We only issue the full refund if we agree the items was not as described. • If you request for exchange, we ask the customers to pay shipping cost to resend. We only re-ship the new order once we receive the order in original conditions & the shipping cost. • All of our listing is made to order & normally take 1 - 5 working days to send off except the ready made items. • If you go to your purchase & review page & looks for your order you can track your order. Estimate delivery time after ship. • Other • 7 - 14 working days. • Unfortunately we can't guarantee the delivery date for international shipping & sometimes can take longer for depends on the event & season. • If you still have not received in 25days of order, please check the tracking & if there is any problem please contact us & we will contact Royal Mail. • For custom order can takes longer than 5 working days to send out. • Fast shipping is only available for UK customers but if we have a lot of waiting order we don't accept sometimes. • We don't accept fast shipping for international customer due for very high shipping cost but we can send out the order quicker to deliver quick as possible, so if you are on rush please contact. • Also if you are international customers & willing to pay over £50 for the shipping cost to delivery within 3. 4 days please contact first. • All the UK & Northern Ireland order ship with 2nd Class Signed for delivery. • We will send the tracking number with shipping notifications. • Most of International order ship with International Tracked & Signed delivery except some country where doesn't support the service. But all of the order send with ether Tracked or Signed Delivery & will always get delivery record. • Please keep track your order on tracking system. • When Etsy tracking system doesn't show the update, track directly from the Royal Mail website or delivery partner's website. • Please contact us if you have if you have any problem or inquiry about your order. How to wash and dry the synthetic dreads. • Wash & rinse very theory the scalp & where braided. • You can dye & bleach the regrows, the dreads won't dye even if the products touch. • Wash & rinse very theory the colours & shampoo. • I recommend to dry the dreads naturally & avoid to use the hairdryer if not necessary. • If you use the hair dryers with medium heat only. • The best ways to dry is towel dry the dreads very well first & if you want to dry natural or dry only where braided with hair dryer. • If your are braiding the dreads with your hair, you should remove the dreads in 2. 3 month or before. 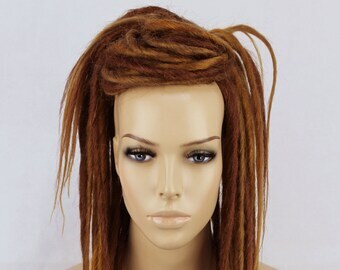 • If you are crocheting the dreads into your natural dreads then you can keep as long as you like but you will need to repair the roots of your natural dreads. • You can re-use the dreads if you keep well. • Hand wash only not machine washable. For any inquires please contact us. The most of items are available to custom made for you. The price is depends on the request and if you are interested to customise the order please contact us first. For all of the wigs is one size only. Inside of the wig is made with elastic band and has the hook to adjust the size. It fit to the most of head size. 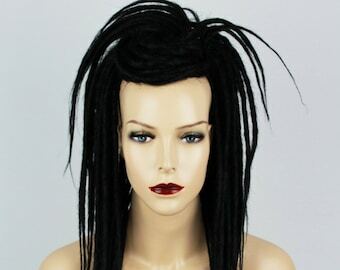 For the Synthetic dreads care please have a look at Additional policies and FAQs sections on our main page. Jet Black Synthetic Dread Falls. 20 inches long. 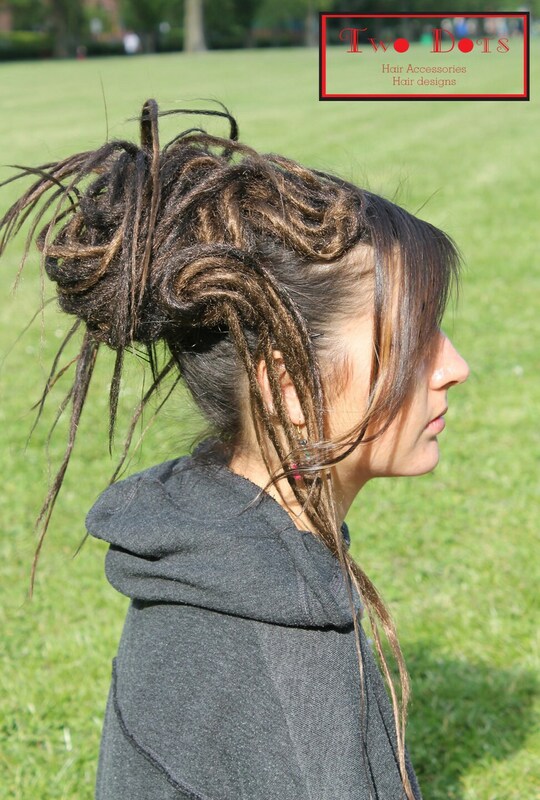 Black Grey & White Synthetic Dread Falls. 20 inches long. Blonde, Turquoise & Light Blue Dread Falls. 20 Inches Long.